ECU team manager Craig Stephenson is looking forward to the game and building on the confidence the side has shown in the last month. “We have had some positive results in the last couple of weeks with wins over Balcatta in the cup and away at Armadale in the league,” he said. He knows Subiaco are still finding their feet in the NPL, but is expecting a tough game against former ECU player Gerry McEwan’s side. 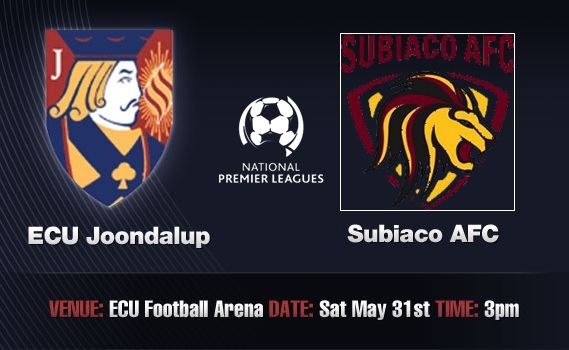 “Despite being a new addition to the NPL, Subiaco has been playing some good football and will no doubt be looking to take the game to us. We have the upmost respect for Subiaco and will be looking to make this a difficult to place to come and get a result,” Stephenson said. In team news, defender Charlie Comyn-Platt should return from injury, while Danny Dixon is fit after limping off last week at Stirling. Subiaco arrive at the Arena after conceding a late goal last week against Perth SC, to go down 1-0. They are yet to win in the league this season, but their performances have been improving each week. In team news Ger Fitzgerald and George Tchami both return from suspension, but Laurence Gaughan is still out injured, and Jordan Rhodes and Alex Randell are unavailable. The under 18’s kick off at 11am. They sit in second place on the table, level on points with Subiaco, so it should be a great game to kick off proceedings on Saturday. The under 20’s have the chance to move into the top five with a win against Subiaco, they kick off at 1pm.